While in the process of exploring anthropogenic wetlands in the Upper Klamath Basin, a hydrologist with the Bureau of Land Management pointed me towards some interesting experiments by the USGS on reversing the effects of land subsidence. The USGS study is called “Simulated Holocene, Recent and Future Accretion in Channel Marsh Islands and Impounded Marshes for Subsidence Mitigation” and is part of the Survey’s REPEAT project. Like a form of soil sublimation, subsidence is the process whereby peat soils oxidize or burn into the atmosphere as a result of being drained and farmed (a topic we posted on earlier in reference to The Everglades). The situation in the Sacramento Delta (where the USGS study was performed) is particularly challenging and timely because its leveed islands have subsided as far as 15′ below sea level at the interface where the islands meet the coastal tidal zone (see map above). We’ve been speculating on what practical methods could be used to manufacture earthen mass in places like this. 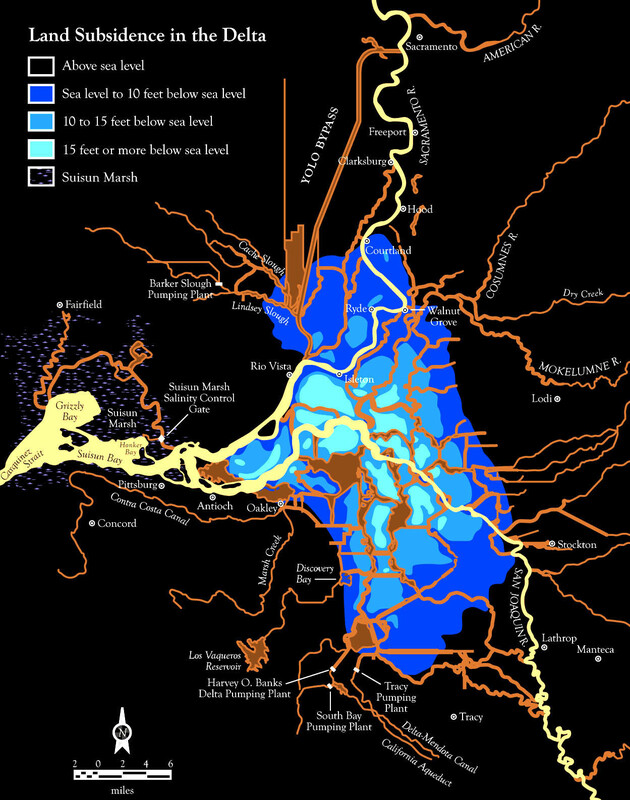 And what the Simulated Holocene study found was that by deliberately manipulating water regimes to mimic what the Sacramento Delta experienced during the Holocene (which was a very gradual and slow rise in water levels), peat soil can be created at rates much faster than for background ‘natural’ (or rather “post natural” natural conditions) found in the Delta. Functioning wetlands generally tend to slowly amass material, but that rate can be accelerated through fine tuning and deliberate manipulation of water levels. USGS scientists performed their study on both a leveed island (the “impounded marsh” of Twitchell Island) and on non-leveed islands, and found that soil could be accumulated much faster with the use of the levees because they allow for greater control of water and better contain the organic plant matter accumulating within them. 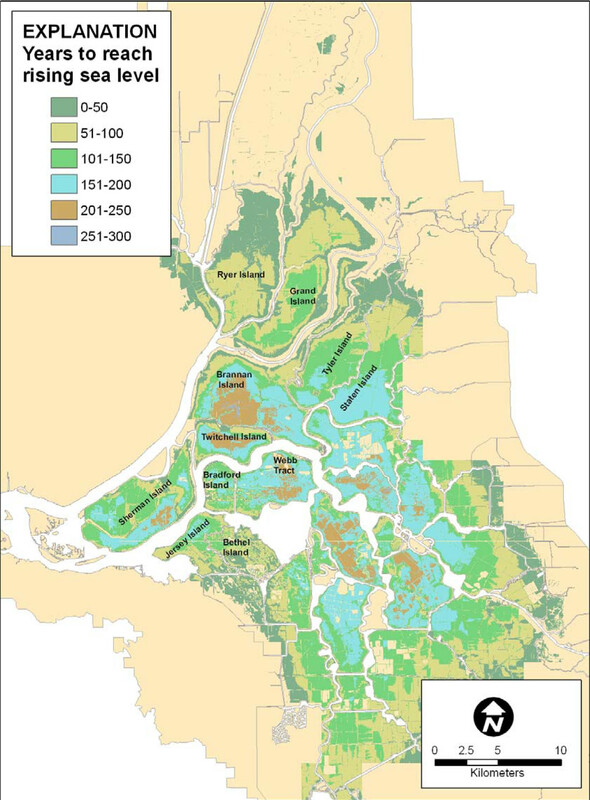 The Simulated Holocene study states that there are unknowns and the process might be further optimized through more extended research (and hopefully a new collection of experimental landscapes upon which it might be tested), yet the study also provides a projective map showing an entirely different scenario for how the Sacramento Delta could be reclaimed by a method remarkably akin to what made it subside: farming using the existing levees. 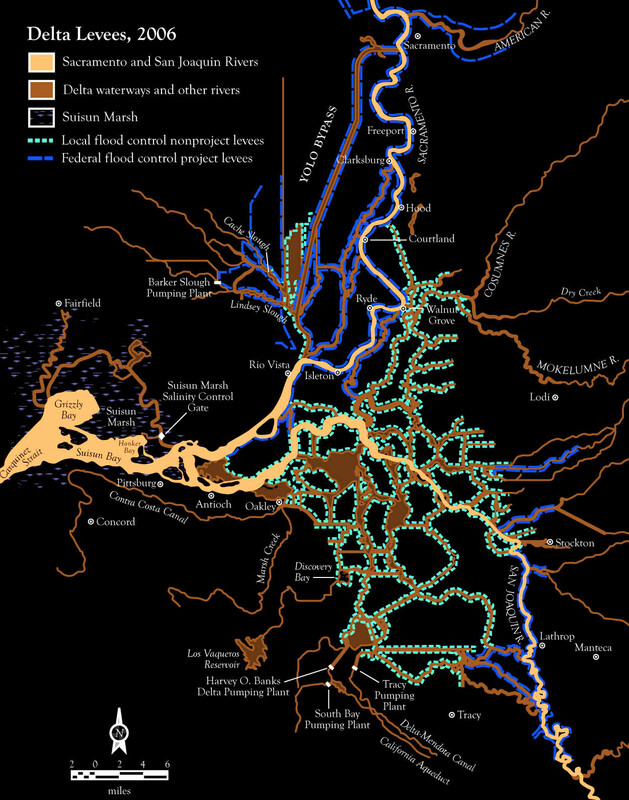 That is, the very infrastructure that has led to the unsustainable state of the Delta, might be the most effective infrastructure for reclaiming it. [Projective scenarios of the Simulated Holocene Study, showing the time it would take to return the delta to a (rising) sea level by wetland soil farming within its leveed islands]. Accordingly, over the next couple centuries the Delta could continue to be farmed, but in a very different manner and for entirely different crops. While in limbo awaiting the glacially paced decisions and subsequent actions of the delta’s ongoing planning, we could be farming soil and a lot of other things. If excessive amounts of the Delta’s water isn’t otherwise diverted to southern California (or before it makes its way down there), it could be pumped into these inverted islands and quickly populated with vegetated wetlands that would simultaneously denutrify and cleanse the water, provide much-needed habitat along the shifting Pacific flyway, re-manufacture land and provide new recreational spaces. As the state of California continues to be forced to buy up more and more of the Delta Islands from farmers that are succumbing to saltwater intrusion, these infra-ready islands could be repurposed as a nationally renowned park for wildlife and recreation composed of constructed habitats quite different from current schemes, all of which could be achieved with almost no infrastructural expense. The infrastructure is already in place, and raising the elevation of the islands will only strengthen the overtaxed levees. In such scenarios, the speculative Saline Lands Exchange Authority proposed by The Delta Project could find itself managing for a range of productive terraforming practices, rather than “non-productive uses”, which would certainly entail coalitions with the Fish and Wildlife Service who have years of expertise in farming habitats and wildlife in all sorts of compromised and challenging situations like this. Great! Though this post is so different than the former blog content. Failure rates are significant, probably between 2-7%/year. So deeply subsided islands are likely to flood and be abandoned before they would rise to near the water level. But it might work better for less subsided islands.